A little leftover tile from your home remodel may be a blessing in disguise when you need to repair a tile floor or backsplash. If you end up with a lot of leftover tile … well, let's just say you can never have too much of a good thing. Use odds and ends of handsome tile for easy, inexpensive crafting projects. 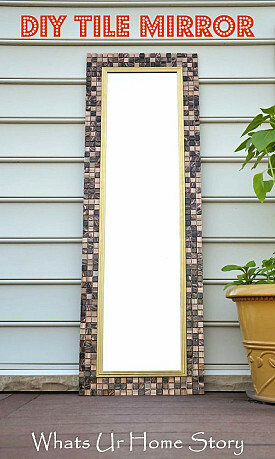 Waste not, want not -- even tile fragments can add pizzazz. 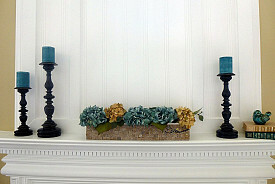 Here are 7 DIY tile craft inspirations from Hometalk. 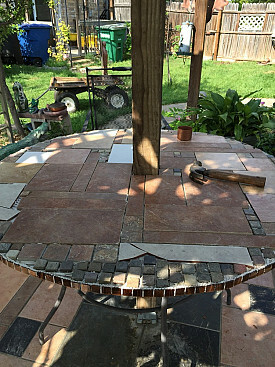 Install tile in an avant-garde mosaic to turn a hand-me-down patio table from weatherbeaten to wow! Lydia and her husband chose an eclectic assortment of different-sized leftover tiles, including broken pieces, and adhered them to the wood surface with thinset mortar. 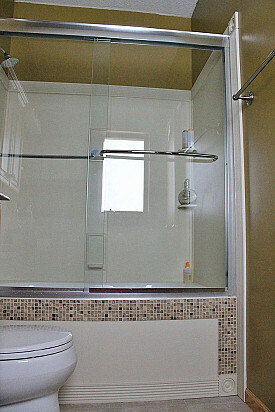 After the thinset had dried, the finishing touch was an application of shower grout. 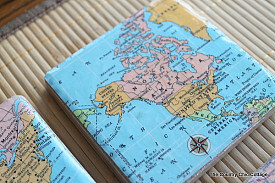 Combine surplus tile with no-longer-needed maps to create pretty and practical coasters. (Great as gifts or as souvenirs of your travels to faraway places.) Angie of CountryChicCottage attached map sections, zeroing in on her home's location, to her tiles using mod podge. Self-adhesive felt stuck on the bottoms keeps the new coasters from scratching up the furniture. Every Mom deserves to hunker down with a grownup drink and a magazine to enjoy some Me Time … preferably on a cute and cozy secluded patio. Lisa of Sweet Tea N' Salty Air deliberately smashed a stack of unused stone tiles with a hammer to create rustic outdoor flooring for her personal space. 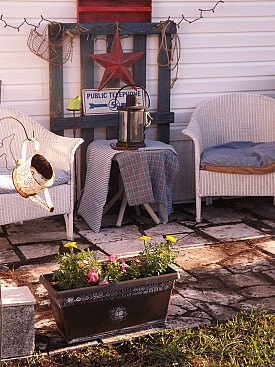 The tiles were "grouted" using moss gathered in her backyard. A whirlpool is the perfect hideaway to refresh your body and soul, but what do you do when the bathtub front is so ugly that you want to hide it away? Nancy created a fiberboard panel -- removable, to allow access to the whirlpool mechanicals -- covered with leftover pieces from the tub surround and accented with tiny mosaic tiles. If your kitchen's got the blahs, have a little fun and show off your sass with the help of bits of broken tile. 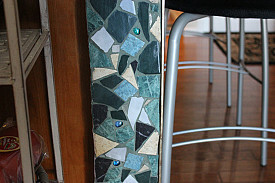 Carolann added color, texture, and geometrics to the sides of her kitchen island by using ordinary grout to stick on ceramic tile shards and glass beads. This embellishment can be easily removed when it's time for yet another change. While a stylish frame will add "ooh la la!" to a plain Jane looking glass, it might also break your bank account. That's why Vidya of Whats Ur Home Story made a frame herself instead, taking a $5 mirror all the way from meh to marvelous. She revved up the edging with gold spray paint, and then mounted the whole thing on a dramatic background of tile and MDF board. Grout is optional. Who else can't resist a really striking planter? For the most unique style of all, you'll have to craft it yourself … which is just what Laurie @ House of 34 did. She silicone-glued tile to the sides of a simple handmade wooden box, then stenciled on a dainty branch motif with the help of some black craft paint. Need some new tiling work in your kitchen, bathroom, or outdoor space? Find a reliable tile contractor to get the job done. How Much Does a Ceramic Tile Backsplash Cost?